Earn 1 Point for every $1: Get 43 points rewarded to you when you buy this item. How do we start explaining all the stunning details of this dress?!! You'll have to just view them all in the picture: start with the...Soft sheer skirt with gold foil applique...Red ribbon puff sleeve accents...Red gem and ruched fabric surrounded by gold designs. As with all of our dresses...it is Washable, Durable, Comfortable and has No Shedding Glitter! 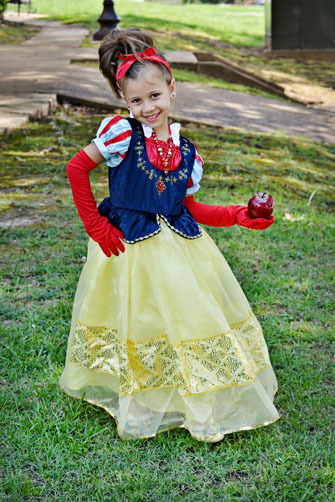 After my granddaughter received her Snow White Dress, the outer skirt started to pull away from the waist and lower trim. You guys were SO awesome!!! You stood behind your product and got it replaced for me. You have been so helpful, so very friendly and quick to solve my problem. I had thought I would just try to sew it back together, but am thrilled that you are replacing it for her. She is excited to have it back to start pretending again. The dress was really made VERY WELL. I have and will recommend your business to everyone I know who is in the market to help little princesses look beautiful. I have purchased 4 dresses for my daughter and 4 dresses to give as gifts. The Little Dress Up Shop has always been so service oriented, I wish all companies would treat their customers like this. I made an error in ordering once and the response was timely and satisfactory. The clothes themselves are high quality and perfect for dress up. Thank you! This dress is so beautiful! My daughter is wearing it as I type and you can totally tell that she feels like a true princess. 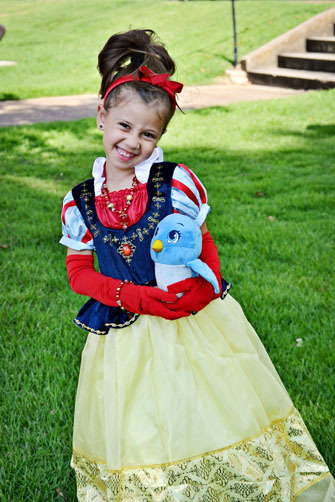 The details in this dress make it a star, and you won't find a prettier snow white dress for the price. Everything from the sleeves to the collar to the intricate detail on the chest just scream royalty. 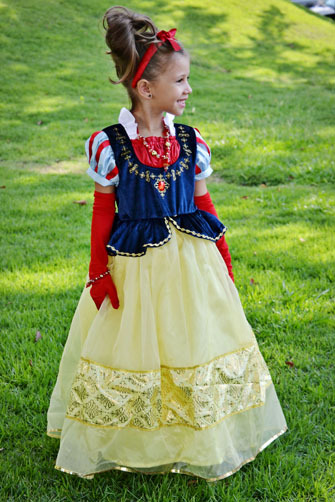 If you are trying to decide between a snow white dress, this is the winner, hands down. I ordered two different dresses for my granddaughter. Snow White and Elsa. They are both beyond cute and the quality is more then I could have hoped for. 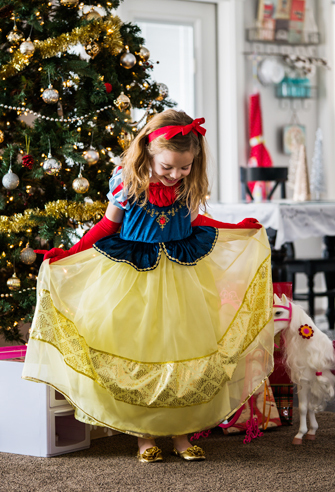 The Snow White dress has every detail you could image and I can't wait for my granddaughter to wear them. They are a gift (if I can wait)! Don't hesitate to order from this company. You won't be disappointed!!!!! 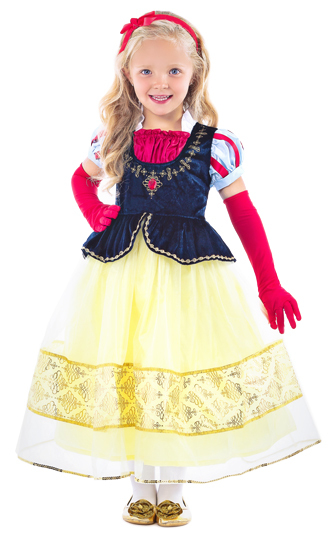 My daughter wanted to be Snow White for Halloween, and I chose this dress because it was the most authentic looking Snow White dress I could find. 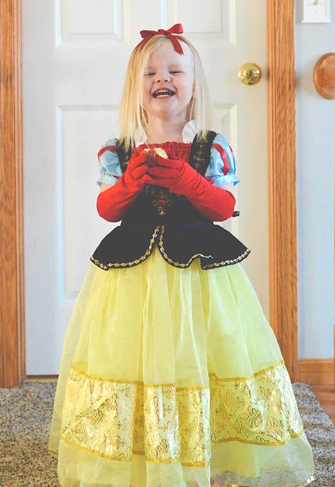 My daughter loves it, and she was the best dressed Snow White in town. Actually, she was the only Snow White in town. She got so many compliments on her dress, and several other parents asked where I'd gotten such an amazing costume for her. It was cold on Halloween, and the dress was roomy enough on my 3 year old to fit 2 warm shirts underneath and warm sweatpants under the skirt. It's now living in the dress up box and is worn whenever we watch Snow White! It will come to Disney with us this summer, too. I wanted to comment on how impressed I am with your customer service. I will defiantly talk positive about your store/website to others.